The reason why I dove into this entrepreneur lifestyle a few years ago was freedom. Freedom to create my own schedule. Creative freedom. Freedom to grow. At the same time, I wanted the excitement of varied days. Some days the universal self-employed uniform of yoga pants and a face mask is my go-to. Other days I’m running around town snapping photos, searching for more caffeine, or meeting clients. I like to look good while living out my entrepreneurial dreams, but I've never been one to follow trends too closely. I like classic pieces that will last a while. When C’est Moi approached me, I felt like I found my people. Their pieces have helped me feel easy breezy, but put together from client meetings to mountain tops and everywhere in between the past couple weeks. I've received so many compliments. Plus, they're Canadian! 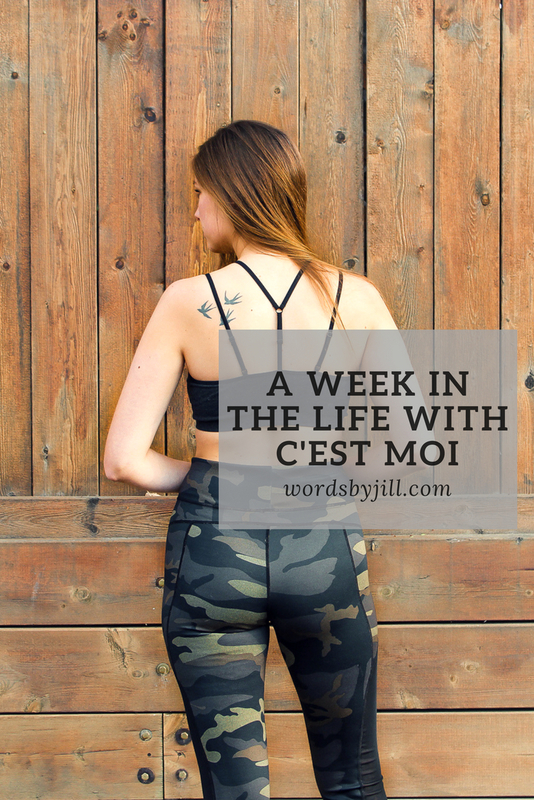 Because some of you clicking through from my social media community don't know what I actually do with my days (other than drink coffee and post stories of my dog), I thought it would be fun to put together "a week in the life" ...all while wearing C'est Moi, of course. Most of my clients are remote, and a lot of them are international. That means I rely heavily on Google Hangouts for my video calls. I also try to group calls together in a single day so my work flow has fewer interruptions the rest of the week. I like to be comfy when I'm working from home, but I'm still running a business, so I need to look professional when it's time to hop on a call. This light knit from C'est Moi is the best of both worlds and I love the sheerness for spring! Just add light wash denim and lots of caffiene. Like I said, I try to batch my days to add a bit of routine to my flexible schedule. While Monday might be dedicated to answering emails, admin tasks, and phone calls, Tuesdays and Wednesdays are reserved for my keyboard. I start early, typing stories for business owners and managing their social media accounts. Content creation, like social media and blog photos, typically happens on these days too. Well, I actually move every day of the week, whether walking Champ or sweating at hot yoga. Either way, I like my athletic wear to be comfy and cute so I can walk the dog around the neighbourhood then head straight to the studio. 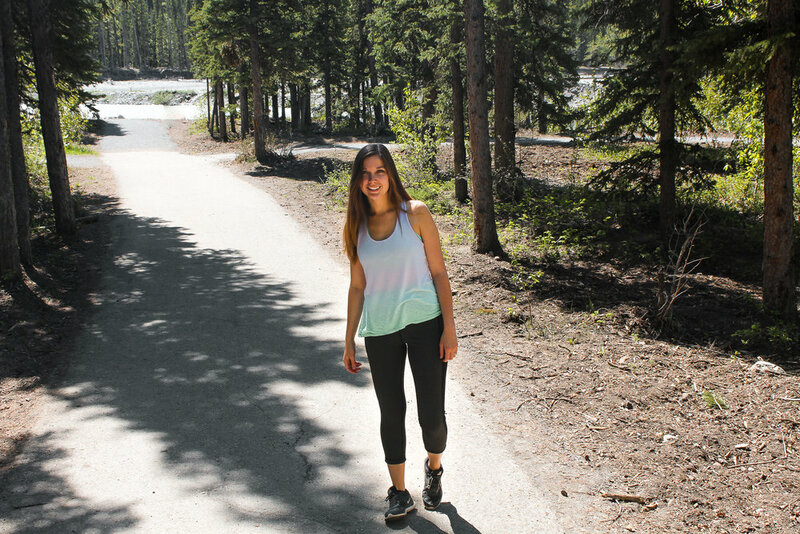 Lately, I love wearing C'est Moi's Aloe Vera sports bra because it's incredibly light, but still feels supportive. And these camo leggings might just be my new favourites! High waist anything is a win in my books. I leave Fridays for loose ends, so Thursdays are typically editing days. I work through the stories and social posts I've written throughout the week, crossing I's and dotting T's and scheduling everything for the following days. By 5pm, my to-do list should only have a few stragglers left for Friday. Summer is here! I try to start and finish early on Fridays to give myself a little bit of a break. I've said before that the #hustle is real and I am a huge believer of living a balanced life. When the sun comes out, one of my favourite activities is wandering around downtown until I find a sunny spot on a patio. Along came C'est Moi, and my patio style just got a whole lot comfier. I know this oh-so soft bamboo dress will be a summertime staple in my closet! I wore it with my Steven Madden sandals, and threw my camera in my Matt & Nat backpack for a day of exploring the city. If you know anything about me, you know I love to be outside. My perfect weekend includes walks along the river, skipping stones, and playing follow the leader through the forest. I would live in a cabin in the woods if there was strong enough WiFi. This past weekend we packed lunches and drove to the foothills as usual, this time with my new C'est Moi to wear on the trails. Those camo leggings I wore earlier in the week? They reverse to become this gray side. Yes, please! I'm definitely going to pick up another pair of these. I've said this before, but I love supporting Canadian brands. Even better if I look cute at the same time! I highly recommend checking out C'est Moi for yourself. Let me know what you choose!